Mediterranean pilot books commonly advise that taking a line ashore could be useful. This is very true for a variety of reasons. The first is that in crowded anchorages it allows many more boats to be accommodated. 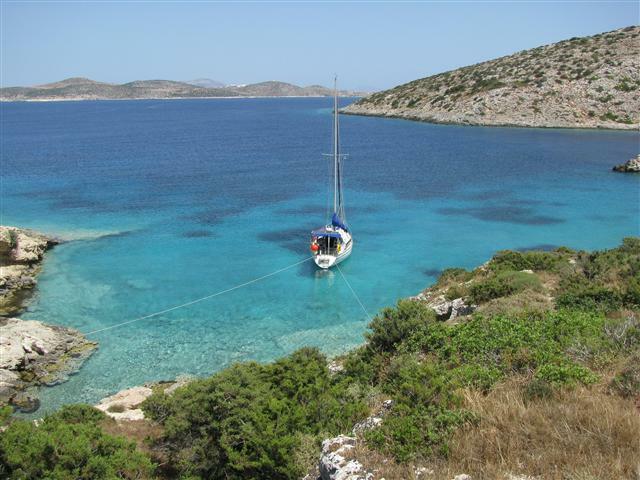 In the very popular Greek anchorages there can often be fifty or more boats all around the shoreline, as close together as if they were in port. In windy conditions boats lie more quietly if held between anchor and shore, especially with the stern into the wind. The anchor is more secure if it is not constantly being asked to set and reset as the wind changes. Getting ashore is easy by hauling the dinghy along the lines. However, the pilots seem to assume that the reader will be able to carry out the activity without any problems, whereas the opposite is often the case. It is more easily done with a little additional equipment and a simple technique. 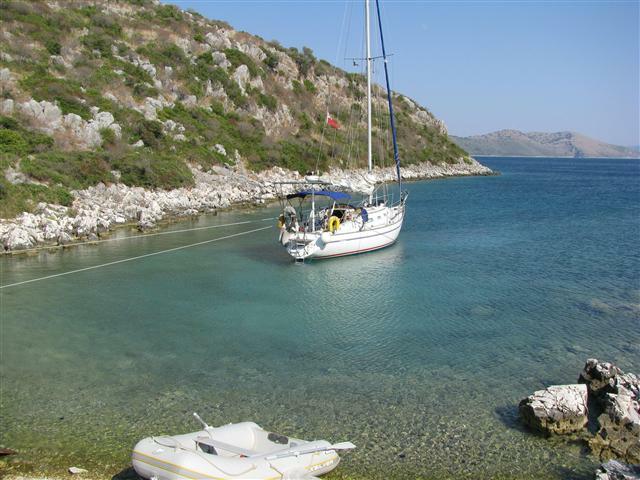 In a very narrow anchorage, shore lines can hold the yacht centrally, keeping it clear of rocks. The equipment consists of two long warps that can be runout from the stern of the boat. 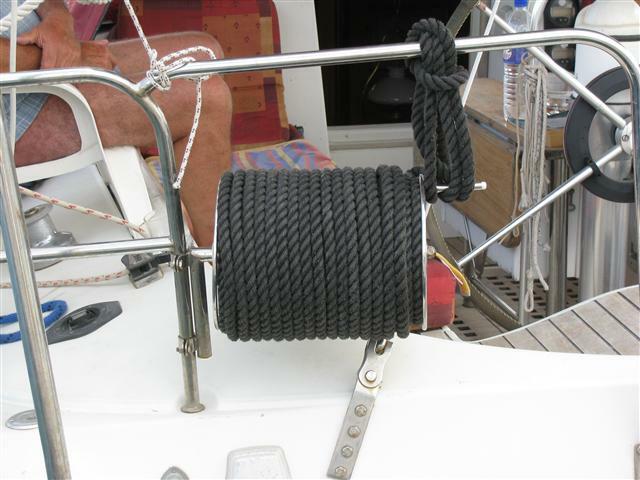 Many liveaboard cruisers carry up to 100 metres of warp on drums mounted on the pushpit, or Ankarolina-type tape drums mounted outside it. Polypropylene is a good choice for stern line material as it floats and does not snag on underwater rocks when being taken ashore. Our stern is relatively narrow with little space for any extras, so instead we have two dedicated 40 metre warps that are stowed in homemade ‘flake bags’. These are long, narrow bags made from waterproof nylon with the long edge fastened with Velcro. The warps are flaked into the bags after each use and will always run out cleanly when asked. Our warps are 40 metres each, braid-on-braid 12 mm nylon. The bags are made from polyurethane-proofed nylon bought from one of the marine materials suppliers. The bags are closed with Velcro Ankarolina tape reel on the pushpit used for shore lines. The first decision to be made is where to attach the shore lines. The first requirement is that there is sufficient water for the boat to float near the shore. Trees are perhaps the best anchor point ashore but it is usually possible to find a sufficiently large rock that will allow a rope to be taken around it without fear of slipping off. In many cases a single line ashore will hold the boat steadily enough but if a stay of more than one night is anticipated two lines will make the stay more comfortable. Once a likely place to attach the lines has been selected it is best to put the boat into roughly the final position to ensure sufficient depth and to get a feel for where it will finish up, with transits if appropriate. Then motor forwards about three or four boat lengths and drop the anchor, unless the water is exceptionally deep, in which case more may be needed. Motor the boat astern toward the shore, checking chain run-out briefly before the final position is reached to ensure that the anchor has set. Leaving the gear in astern, the line carrier, wearing suitable shoes, climbs into the dinghy and attaches the free end of the line to it. He rows ashore, finds a rock or tree and ties the line to it. A bowline is not the best knot for this as it cannot be released under load later – a round turn and two half hitches is better if possible. Meanwhile the crew aboard ensures that the line runs out smoothly, keeping it well away from the propeller, and can attach further lengths of warp if necessary. 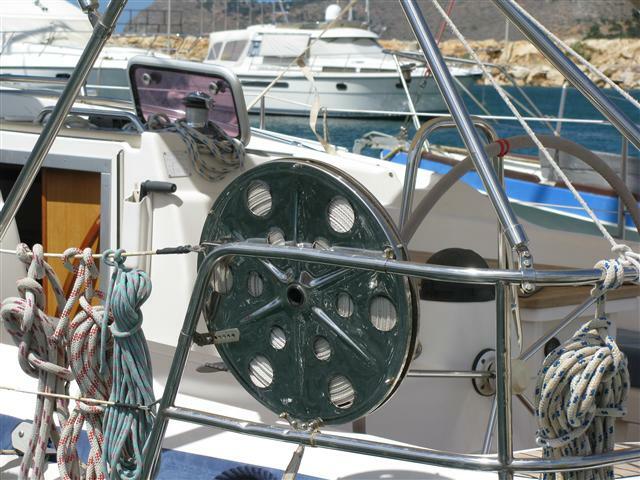 Once the line is tied ashore it is taken to a genoa winch, where it can be adjusted as needed. A second line is taken ashore in exactly the same way. Only when both lines are attached at both ends should the engine be taken out of gear. Many people prefer to swim ashore with the line, although this has some disadvantages. A swimmer is far less mobile than someone rowing a dinghy and it can be difficult or impossible to react quickly enough if things go wrong. Mediterranean rocks are heavily infested with sea urchins that can cause severe pain if knelt or stood on. In a crosswind the yacht will blow down quite quickly and the line carrier may need to haul in before he has time to tie on. 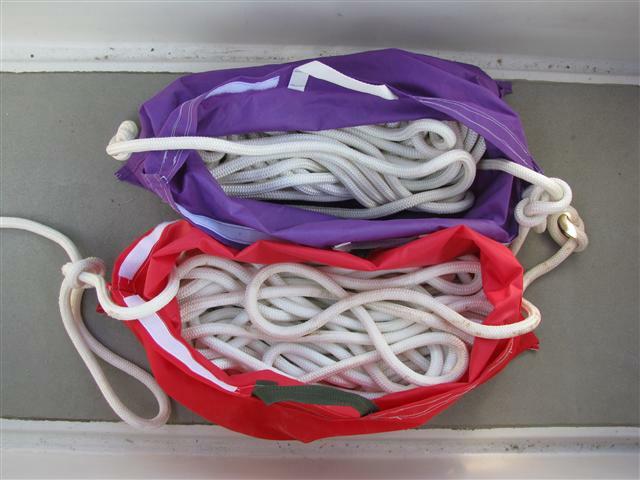 It may even be necessary to find a temporary belay point if the wind is fresh, to prevent the boat from going too far. 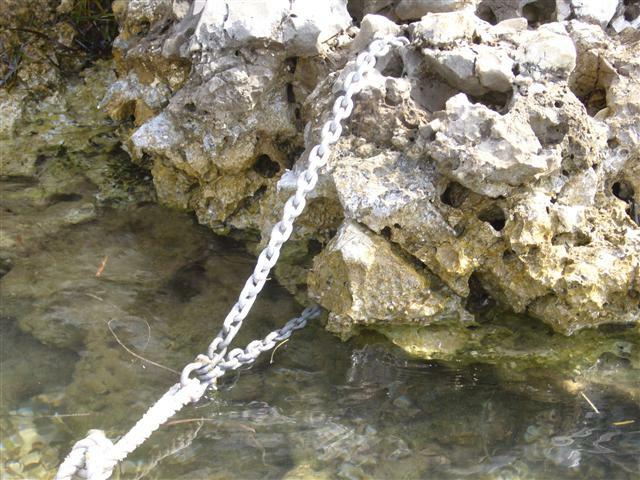 When tying to rocks and intending to stay for a while it is worth taking a length of chain around sharp rocks and attaching the warp to that, to prevent chafe. In a really big blow there is no safer place to be than with the stern into the wind, with two good lines ashore, preferably attached to large trees, and with a good scope of anchor chain out into deeper water. Two years ago I managed to crush a finger between chain and windlass when repeatedly re-anchoring in a bay in gusts up to 50 knots. My only recourse at the time was to drop anchor, motor astern until the rudder touched the mud ashore and take two lines out to trees. We remained there for three days while my finger healed, in perfect security. 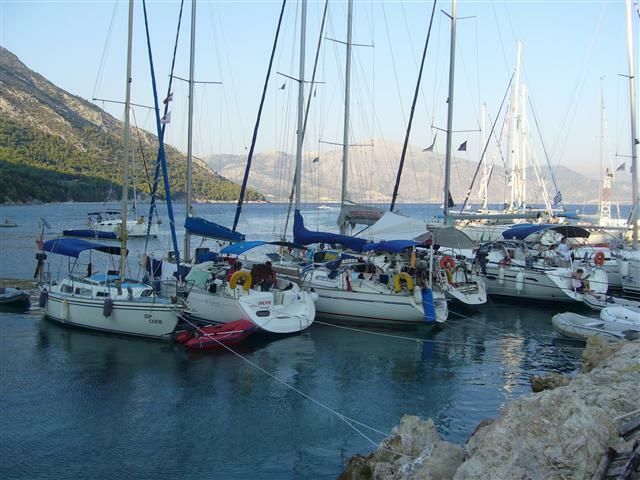 In the crowded ports of the Ionian at the peak of the season it is common to find no berths inside the harbour. In many cases in quiet conditions it is possible to take lines ashore to the outside of a breakwater, allowing everybody ashore with the briefest of dinghy trips. In some of the windier places, Ay Eufimia for example, it is often quieter tied to the outside of the breakwater than it is inside the harbour. 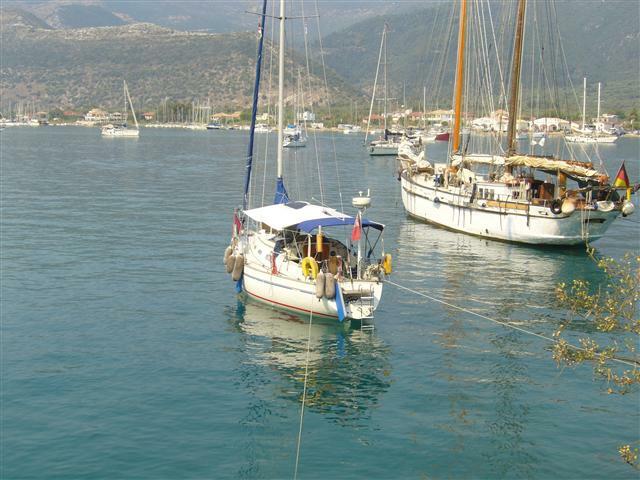 This photograph was taken at Kalamos when the inner harbour was full to overflowing.